Jon Griffith was the closest he had ever been to the top of 7041-meter Link Sar but he lay curled up in a ball, wracked with fever. A chest cold had turned into a more serious infection after 17 hours of climbing. Nursing him to health in their tent on a ridge high above the northwest face of the unclimbed peak, his partner Andy Houseman considered how he could get them both safely back down. Bad weather was on the way. Griffith's fourth attempt on the peak deep in the Kondus Valley of the Karakoram, in Pakistan, seemed doomed to end like the other three, with the summit still unclimbed. 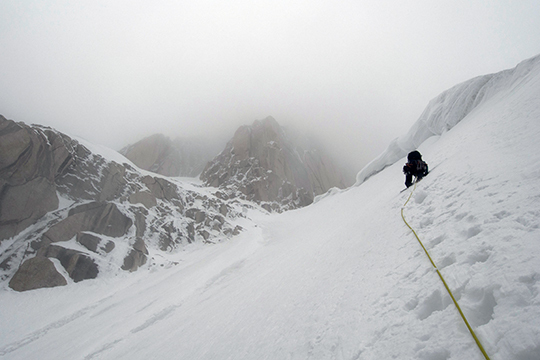 "I hardly slept that night," Houseman told Alpinist via email two weeks after returning. "I just spent the entire time running every scenario through my head, figuring out how to get us off the mountain." But by the next morning, thanks to Houseman's care, Griffith persevered. The main summit, which lay up a long, exposed ridge, was out of reach, but the pair thought they could make the closer West Summit. Following the west ridge from their bivy, they topped out that afternoon. The celebration was short-lived, however. Griffith's fever returned with a vengeance and the weather window was quickly closing. Link Sar has seen few attempts since it is remote and because it is difficult to scope out prospective routes (the only way to get a clear view of the northwest face is by climbing neighboring peaks). 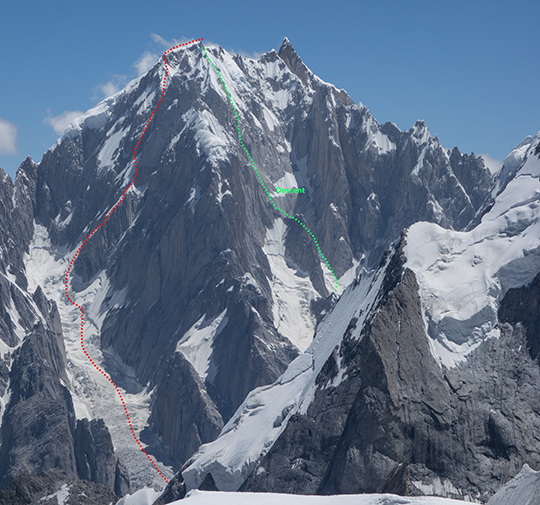 A Japanese expedition attempted the east face in 1979 and a team that included George Lowe turned back from that same line in 2001. There were no documented attempts on the north side until Griffith made his first attempt in 2012. Griffith returned in 2013 with Houseman but bad weather turned the pair around. 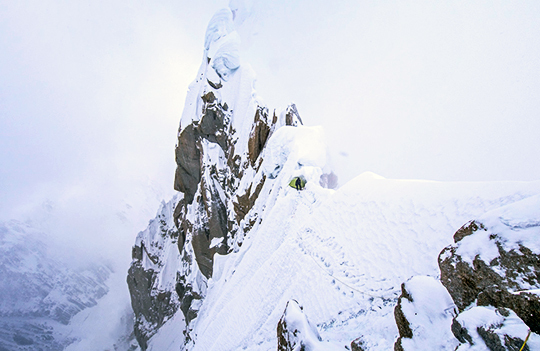 Last summer, Griffith and American climber Kevin Mahoney reached the top of the northwest face but ended up too low on a complex ridge. However, that trip gave Griffith insight on how to finally piece the line together. "Last year with Kevin was one of the toughest times I've ever had in the mountains—both physically and mentally. In the end, we just ended topping out in a really bad place on the northwest face. The ridge to the West Summit from there was basically a complete shut down, but the only way to know that was to actually climb it and get there. If I hadn't failed with Kevin last year, we wouldn't have succeeded this year," Griffith told Alpinist from Chamonix immediately after the Link Sar trip. Still the undertaking required an intense effort. Griffith, a British photographer and alpinist based in Chamonix, and Houseman, a Yorkshire climber, left base camp at 4500 meters on July 12. The pair broke trail in deep snow. Those punchy conditions and a snowstorm left them short of their intended advance base camp. "We almost pulled the plug that evening, as we sat in the tent with snow dumping outside and the tent getting soaking wet, but instead we used up all our toilet paper to dry the tent out and kept going the following morning," said Griffith. The following day the pair started up the steep, snow-covered northwest face under overcast skies and light snow, which kept the snowpack stable. "Anything the sun touched would come crashing down so it was a bit unnerving on that first day," said Griffith. "So I think we got pretty lucky with the clouds." They bivied at 6100 meters to wait out the snowstorm and climbed the next day. "That ended up being a wise decision as I'm not sure we would have survived the second day if we had kept going—the sun hit the face and purged the whole thing," said Griffith. 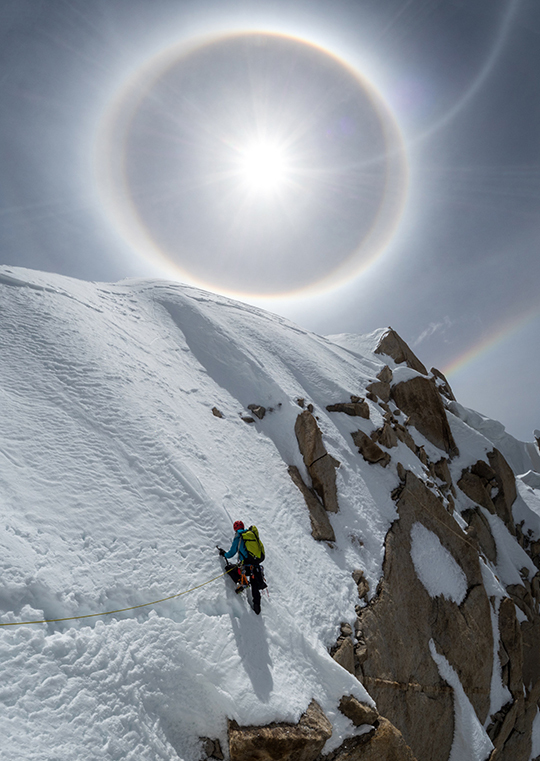 After 17 hours of climbing the next day up 700 meters of mixed terrain, Griffith and Houseman topped out on the same ridge Griffith reached the previous season but higher up. After reaching the ridge, warming weather began to melt the snow cover, sending down slides. "The sun destroyed us on the final few hundred meters," wrote Griffith. "Topping out on the ridge was a great feeling as we were finally off our front points, but there didn't seem to be any bivy spot in sight. After a very long pitch that seemed to take me well over an hour, we finally found a place on the ridge. I was a little worried as the final pitch had basically been a foot of unconsolidated snow sitting on top of honeycomb ice—the exact type of terrain that shut Kevin and me down last year. It's really slow going on this terrain as you basically have to dig a channel through the snow and ice, but it's all unprotected and steep and awkward at times." Then Griffith's fever hit. Still, the weather held and thanks to Houseman's care, Griffith kept moving long enough to tick off the West Summit (6938m), a distinct unnamed summit a kilometer west of Link Sar's higher summit that is sometimes called Link Sar West. The next day, however, was trouble. At 1 a.m. the alarm went off but bad weather had rolled in again and it was snowing. "This was a real problem for us as our descent line lay on the south side of the mountain down a huge gully and valley that we knew almost nothing about. The one thing we did know was that being in the gully in bad weather would be lethal. Thankfully it stopped an hour or so later and we started the 2500-meter descent back to base camp." While he may not return for the main summit of Link Sar, Griffith intends to use what he learned over four years of attempts to climb other Himalayan routes, saying, "I can't wait to take that experience and go somewhere bigger and steeper." He has his eyes on the north ridge of Masherbrum (7821m) farther north of Link Sar. For now Griffith is in Europe, accompanying Ueli Steck on his attempt to link all 82 of the 4000-meter peaks in the Alps.